For the past year, we have been using an old three burner grill that came with our home. The grates were so rusty that occasionally, we’d lose a hot dog in the cooking process. But if we were careful, we could produce decent looking grill food as long as we were okay with the occasional burnt hamburger patty. Three weeks ago we finally decided that we’ve lost enough meat to that old grill and visited Lowe’s to check out their line of Char Broil and Weber grills. After about 20 minutes, we came to a decision on a Char Broil grill with four burners and all the bells and whistles, such as infrared and porcelain-coated grates. We were happy, just not excited…having simply replaced our old grill with a newer one. While paying for our grill, we happened to notice a very large griddle surface sitting on top of a grill stand. A million ideas ran through our heads, as far as all the various foods we could now cook outdoors with a griddle surface. We wanted to stick with the Char Broil brand to match the grill we purchased, so we hopped on Amazon and found their outdoor grill product. We made the purchase for about $300. Assembly took about an hour and it took maybe a total of 90 minutes to season the griddle surface. After that, we were good to go! Note: Blackstone also makes a griddle. It’s carried by Lowe’s, but we found a better deal on Amazon for the 36″ griddle. We would have purchased the Blackstone had we not been trying to match our existing charbroil grill. For me, a crepe is just a really thin pancake. So whip up your pancake batter the way you normally do, but thin it out a little bit with some milk. Make sure your griddle is nice and hot, then pour on a thin coat of batter. After about 30 seconds, add your filling (apples or berries work great) right in the middle of your crepe. Fold the sides inward, then cook to completion. The best part is, if you cook it a little uneven, you can cover up any dark spots with whip cream! You don’t need to have a 20 square-foot cooking surface and three months of training to whip up some hibachi for your friends. If you’ve ever gone out for hibachi, you’ll notice that much of the cooking surface goes unused by the chef. You’ll find that a 36 inch griddle surface is more than enough for an 8-10 person meal. 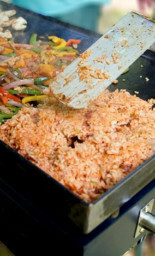 A well seasoned outdoor griddle surface is perfect for cooking steak, chicken, shrimp, rice with egg and vegetables. The trick here, as with most griddle-cooked meals, is to make sure the surface is up to temperature before you start cooking. This can take up to 15 minutes from the point you turn on the burners. Here’s a quick look at a couple of us cooking some hibachi vegetables, rice and chicken. Let’s not forget the kids. If you’re hosting a birthday party, you’ve now got the power to cook 25 grilled cheese sandwiches at the same time! And let’s face it, the name “Grilled Cheese” really lends itself more to being cooked outdoors. Tip: If you’ll be adding a slice of meat to your grilled cheese, you can preheat that slice right on the griddle. Tilapia is a great low-fat, high-protein fish. And its relatively low cost makes it perfect for tacos. Mix ’em together, then rub them on your thawed tilapia (both sides). And let’s be honest, if you’re missing one of those spices, only the most prestigious of seafood critics is going to notice! Toss those tilapia on a nice hot griddle for 4-minutes per side. Once cooked, dice them up right on the griddle and drop them in your taco shells. Top with tomatoes, shaved carrots, lettuce and a creamy dressing or sauce. 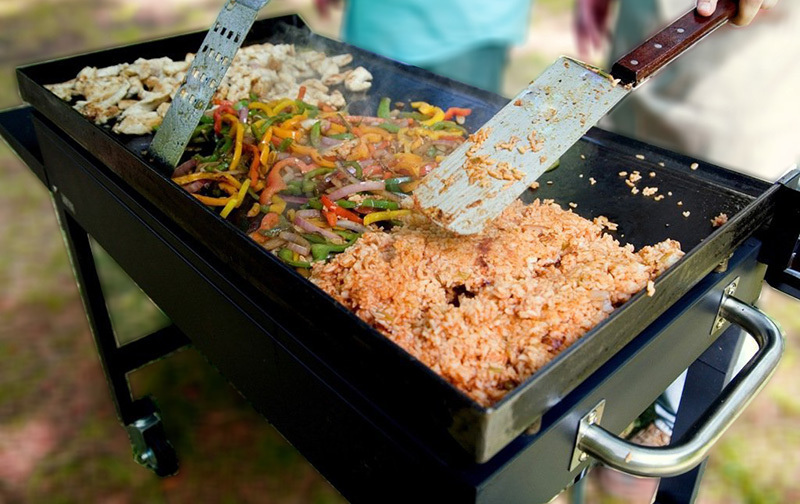 The outdoor griddle brings a lot more to the outdoor cooking experience than your traditional grill. You don’t have to worry about scratching up your grates. You can clean it by scraping it with your spatula, and pushing the leftovers right into the built in trash “hole”. You can get one on Amazon for under $300. At time of writing, there aren’t many options, but the options that do exist seemed to be rated well. Using an inexpensive food dehydrator, you can make any kind of meat jerky with very little effort! This entry was posted in Food / Cooking and tagged griddle, grilling on June 12, 2018 by diy. Receive email updates whenever we post new content (weekly, at most). Unsubscribe easily, anytime. Earn money by writing DIY articles at your own pace.